When Chevrolet introduced its small-block V8 in 1955 one of its highly praised features was its lightweight stamped steel rocker system. With little more than a factory Duntov solid lifter cam a 7,000rpm redline was realistic. This economic valvetrain had its limits though. As long as mild seat pressures of around 100 pounds were used with low-lift hydraulic or flat tappet cams, life was good. As aftermarket cam manufacturers started grinding higher lifts, the rocker’s shortcomings began showing up. First, the rockers bottomed-out on the rocker studs because the slots were too short. Then as spring pressures increased the studs pulled or broke out of the head bosses. The fixes came both from the aftermarket and GM. Longer slot stamped steel rockers pivoting on a pinned-in rocker stud eventually were improved with screw-in studs. 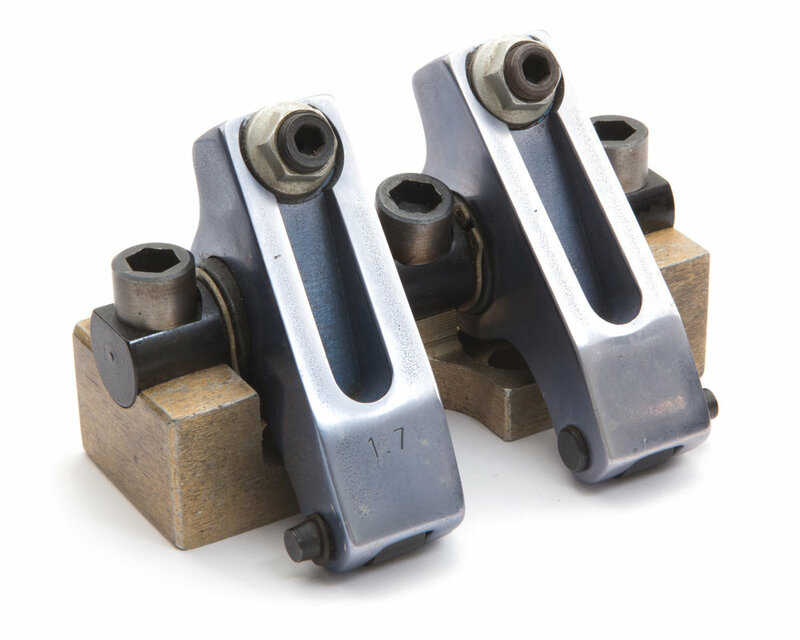 Soon after, the aftermarket industry introduced stud mounted roller rockers to replace the simple OEM style stamped units. Most stud rockers were manufactured from aluminum for added strength and reduced weight, featured a valve tip roller to replace the scrubber pad and rotated on needle bearings instead of a pivot ball. All significant improvements over the OEM units, but there were shortcomings. While stud rockers may be adequate for more mild applications, engine builders who increased spring rates and lobe lifts started seeing premature valve guide wear and more frequent valve jobs. Even with 7/16” rocker studs and stud girdles, the typical stud rocker wasn’t getting the job done. In the 1970’s, Dan Jesel, the founder of JESEL Valvetrain Innovation, started building engines for a growing list of customers. At the time, Dan was building a pair of drag racing engines, a small block and big block Chevy. He would check rotating torque at several stages of the build-up and both engines checked out fine, until the final torque reading was taken with the valvetrain installed and lashed. The small-block required approximately 80ft.lbs. of additional torque to rotate than the big block. Something wasn’t adding up and Dan realized it. The 302 cubic inch small block should have taken far less rotating effort compared to a 427 cubic inch big block. Dan thought about the problem while on a long tow to the race track. That’s when it came to him. One of the main differences between the two engines was the rocker arm pivot length. The small-block had a rocker pivot length of about 1.450 inches while the big-block had a pivot length of 1.650 inches. Dan understood that the big -block rocker tip was traveling in a much larger arc, which resulted in a smaller travel pattern and minimized the scrubbing motion across the valve tip. The small-block rocker with the shorter pivot length was sweeping further across the valve tip that resulted in increased friction and binding. To prove his theory, Dan took a set of small block cylinder heads and relocated the rocker studs further away from the valves so that he could fit big block rockers on the head. The rotating torque test confirmed that it took much less torque to rotate the small-block with big-block rockers. He quickly began moving studs on all of his customer’s small-block engines, but decided there must be an easier way. And there was. In the late 1970’s Dan Jesel invented the first effective aftermarket shaft rocker system for high performance engines, a system that is now the standard on engine builds worldwide. After the shaft rocker system was established as the way forward in race engine design, Jesel built hundreds of kits to fit the most popular O.E. and aftermarket cylinder heads. The rockers morphed into several different styles too, such as the offset rockers required for the spread port cylinder heads. For those heads requiring less rocker offset, Dan came up with a rocker with the shaft hole and the nose roller axle holes bored on a slight angle. As rpm increased on the Pro Stock and Comp Eliminator cars, weight became a big issue and Jesel introduced its Mohawk style rocker that was very stiff, yet very light. It earned its name due to the single rib passing down the middle of the rocker body. So far we have been talking about Pro Rocker Kits for serious racers. However, Jesel recognized the need for a more affordable shaft rocker system that he called the Sportsman Series, that was right at home on most racecars, but cost about the same as a set of roller rockers, new studs and a stud girdle. The Sportsman kits allowed for longer pivot length rockers, various rocker ratios, adjustable stand heights and it was easy to adjust valves as they held valve adjustment, race-after-race. It’s hard to believe, but rocker style is a trendy thing among racers. When the NASCAR teams decided that they couldn’t live without steel rockers Jesel designed a couple of different styles that became popular. Steel rockers are still used on severe duty applications that warrant the need, but aluminum shaft rockers are still the mainstay of the industry. Jesel dedicates itself to providing not only the best engineering and materials available, but also the highest quality technical expertise in the industry. The engineering department constantly challenges itself, finding better ways to design rocker systems, often time making last years tech old school very quickly. Before any part is even machined, the Jesel Metallurgical department quarantines all raw materials entering the building and will release them only after passing stringent tests. And in a quest for a better product, the Metallurgical department is on the lookout for better materials, heat-treatings, finishes and coatings to make our parts the strongest possible. Jesel machinists and CNC turning centers hold extremely tight tolerances and within days can have your order ready to ship. The assembly process is something to behold as the machined parts go through a secondary inspection before final assembly - rejecting any rockers with flaws. Once passed through QC, the rockers are assembled on precision fixtures and sent to the shipping department, where they are checked again for order accuracy, carefully boxed and sent on their way. So, ask yourself why would you want to keep messing around with the hassles of stud rockers when you can simplify your assembly, improve your performance and pick up some easily obtainable horsepower? Yes, the investment is higher but the amount you save in maintenance and aggravation will repay itself time and again. Jesel pioneered shaft rocker systems for race cars 35 years ago and is still the leader today.